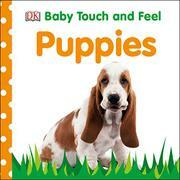 A book of cute puppies: hard to go wrong, right? Extra-puffy board pages hide tactile elements for little fingers to feel in double-page spreads that illustrate contrasting characteristics. The most effective spread contrasts a “messy puppy” with a “clean puppy” (complete with shiny bath bubbles). The small (5 inches square) trim is perfect for little hands. And what could be cuter than puppies? (Maybe Kittens, the topic of a companion volume published at the same time.) Unfortunately, the diminutive size means the tactile patches are also tiny—often less than 1 inch square. Finding the furry or soft bit becomes the game. Pages with extra-subtle tactile features (such as a Westie’s nose) will be quickly skipped over before an adult can even read the minimal text aloud. Placement of some of the patches is awkward too. A black-and-white Great Dane puppy has a bone-shaped black spot that looks as though it was carved into the poor doggy’s chest. Little fingers will tear at the page to see if there is more fur hiding underneath. The tactile elements spoil what is otherwise a language-rich bundle of cuteness.